Dark subjects driven by the dark psychology of the characters rooted in a common thread of loneliness. 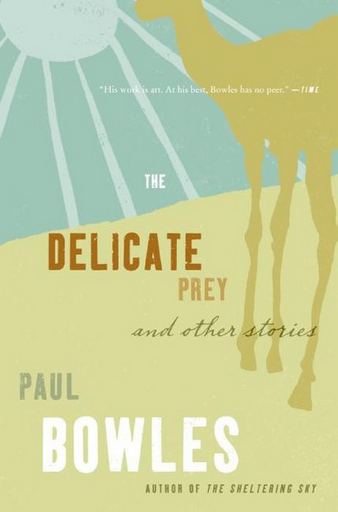 The short stories of The Delicate Prey are best described as “messed up” as someone noted in a short review I spotted on Good Reads. Artfully written bringing early twentieth century Latin America to life, contrasting the natural beauty of the land with the less-than-desirable living conditions of the locals. An element of racism exists among those of Spanish descent toward the native people – known simply as Indians – adding to the tensions and demeanor of the characters, providing a sense of entitlement for some to act upon their ill intentions. In the first story, “At Paso Rojo,” an upper-class woman, Chalía, and her sister, visit their brother’s ranch after their mother has died. Chalía makes a game of emotionally manipulating and injuring a young Indian man who works for her brother. The specific root of behavior is not apparent beyond her open discrimination toward the Indians, though we learn of lying and deceptive behaviors through the story, and her desire to control others. The following passage paints a vivid portrait of Chalía’s diabolical nature. “The Scorpion” was probably one of the strangest stories I read, and the most thought provoking. Two sons had left their elderly mother to live in a cave they dug out of clay for an undetermined length of time. She was left to survive with a bare minimum of supplies, her dreams, and her memories. Surrounded by scorpions in the walls and constant dripping water, she adapts to her solitude. Finally, one of her sons arrives to retrieve her, he seems surprised that either she is still there or alive; she refuses to leave at first. We don’t know why he is there for her, but it is clear their relationship is not good as she is not even sure of his identity. “Who is that?” said her son. Her son looked back at her darkly. Interestingly, the story “The Fourth Day Out from Santa Cruz” paints a dark portrait of loneliness and despondency not unlike the other stories, but with a happy ending, as happy as one could expect in the circumstances. A young man named Ramón signed on to the crew of a ship, working in the scullery. As Ramón continues to find ways draw the sailors’ attention to no avail, he sees an opportunity during their fourth day out at sea. A tired bird far from land is desperate to land on the ship’s deck, but the gawking crew scares it from doing so. As they place bets on the bird’s fate, Ramón brings out the ship’s mascot, a large cat, and trains the cat’s focus on the bird to attempt to catch it. The sailors are impressed. In a situation that appeared to be leading to some type of violent act of Ramón’s doing was cleverly displayed by the cat attempting to catch the bird without success. Yet, Ramón is awarded with the acceptance from his crewmates he craved. At noonday meal they talked about it. After some argument the bets were paid. One of the oilers went to his cabin and brought out a bottle of cognac and a set of little glasses which he put in front of him and filled, one after the other. “Have some?” he said to Ramón. This entry was posted in Book Response, Book Review, craft-based annotation, dark fiction, MFA Writing, short fiction, writing craft. Bookmark the permalink. Hey David,Once again, you have given us an excellent summary of one of the all time classic short story collections. Well done!I’m glad you read Bowles. I know you have an aesthetic affinity for dark fiction, and Bowles is one of the best authors I know at dark. Really dark. Dark in an existential way, that makes you question many comfortable assumptions, including the basic goodness of humanity. And he’s also an incredibly skilled writer: his prose is elegant and about as clear as you can get, and I find his descriptions of the natural world to be particularly lucid. He also does a great job, as you point out, of accurately portraying extreme emotions such as anger, anguish, and despair. That’s not an easy thing for a writer to do, so we can learn a great deal from Bowles on this score as well. Did you learn anything in terms of craft technique that you might be able to put to work in your own short fiction? I'm currently reading Bowles' collected stories. The constant theme is the destruction of innocence. When the innocence of children is destroyed it's tragic (Fourth Day Out is such a story); yet an adult who remains innocent is ludicrous (as the unnamed professor in A Distant Episode, or the other professor in Cold Point – whose innocence it to think that innocence is possible). Bowles is a supreme technician, but spiritually depressing in the extreme. Depressing and dark, yet I see his work as a reflection of reality. Not everyone's reality, but it's rooted in someone's truth. Am I becoming too obscure and esoteric now? Probably.Thanks for taking the time to read and post here. Much appreciated! I will check out Bowles' other works.